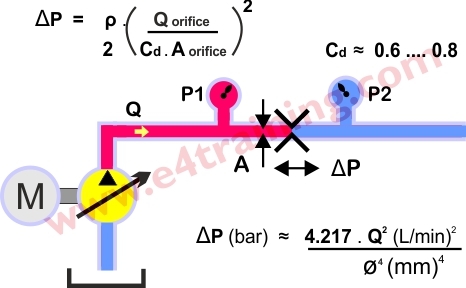 The FORCE provided by an actuator is equal to the PRESSURE applied to the actuator multiplied by its effective AREA (F=p*A). This means that the more pressure or the larger an actuator, the more force you have. However, in practice the load applied onto the system sets the pressure so is our starting point for the calculation, therefore we should probably say the pressure p=F/A. The major benefit of hydraulic, fluid power systems over other drive systems are their very high power density capabilities. A small pump, motor or actuator can transmit much greater power for its physical size than the equivalent sized electric motor. 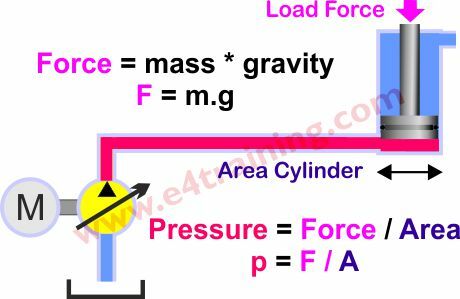 The force required by the actuator will always be lower than that available from the supply pressure; there will be a number of pressure losses from within the system itself. The largest of these is likely to be the flow control valve pressure drop. In order to control the actuator speed, we normally add a small orifice to limit the supply and/or return flow. This orifice will generate a higher pressure drop across it the greater the flow becomes, until finally the supply pressure, orifice pressure drop and load pressure become fully balanced. The energy loss caused by the orifice restriction will be converted into heat within the fluid. While these losses are not ideal you will typically need a higher pressure drop to give better actuator control. It is likely that any actuators used will also cause a small loss of system pressure. Cylinder seals, for example, will typically generate a 3-4 bar pressure loss e.g. 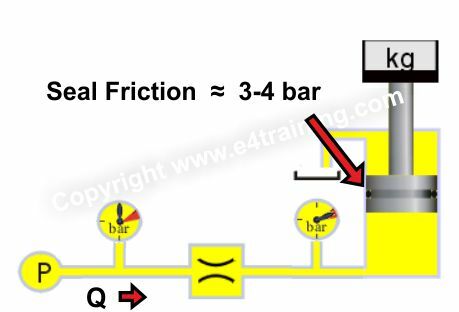 you will need to add 4 bar to the cylinder load pressure before it will start moving. Other pressure losses may come from pipeline losses other component inefficiencies. These should not be significant but we will discuss them later. Supply Pressure = Load Pressure + Valve Pressure Drop + Pipeline and Component Pressure Losses.